The ‘word’ planet is sourced from the Greek word ‘planētēs’ which means ‘a wanderer’. In ancient times the cosmic bodies which were seen to wander relative to the backdrop of the fixed stars, which we now understood to include galaxies and other celestial phenomena, were the planets of our solar system. They were known as ‘wandering stars’ ……. points of light which appeared to move relative to the other lights which did not seem to move. Astrologers have also traditionally used the word ‘planet’ to include ‘the luminaries’, which are the Sun and the Moon. The luminaries are also referred to as ‘the lights’. The Sun lights up the day sky and the Moon lights up the night sky. In modern astronomy ‘the planets’ have come to represent a distinct category which excludes the lights. However in current astrological practise the traditional meaning of the word ‘planets’ has not changed, and is still meant to include the lights. This distinction must be clearly understood by those who wish to participate in any discussion of astrology. Astrologers in the 21st century do of course understand that the Sun is actually a star generating enormous amounts of energy fuelled by nuclear reactions at its core, and that the Moon is actually a satellite of the Earth. The understanding that the Sun is actually at the centre of the solar system has been known to astrologers for many centuries, and is reflected in the ancient Chaldean order of the planets (sometimes referred to as the ‘Ptolemaic’ order of the planets) which places the Sun at the centre: Saturn Jupiter Mars Sun Venus Mercury Moon. 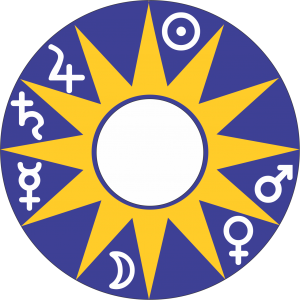 Because astrology is focused on the study of the relationship between the cosmos and our lives here on Earth, the Earth is always placed at the centre of the horoscope, encircled by the symbols representing the luminaries and planets. This geocentric arrangement is in no way meant to deny the structure of the solar system. Rather it is meant to reflect the actual focus of astrological study, and our position relative to our immediate cosmic environment. This geocentric model, which is the horoscope, is also meant to convey meanings other than those which are strictly physical. In this modern age our awareness is predominantly focused on the material and physical aspects of life, to the exclusion of other dimensions of life, which are mostly either ignored or forgotten. These other levels of human life revealed by the horoscope include the spiritual, social, psychological and deeply personal aspects of life. Until the discovery of Uranus, there were only seven known planets: Saturn, Jupiter, Mars, Sun, Venus, Mercury and the Moon. These are usually referred to as the ‘classical planets’ or the ‘visible’ planets. From an astrological perspective the classical planets represent everything that exists within physical manifestation. From the more ancient perspective, when life was viewed within the context of a universe created by God, these seven planets represented everything within divine creation. When it is understood that these seven planets represent everything that exists within physical form, then their meaning becomes more apparent. For example because Saturn is the outermost planet visible to the naked eye, it represents the edge and structure of everything, including boundaries, fences, the skin and the internal skeleton, and the edge of life itself: death. Saturn is seen as the gateway between manifest creation and that which is not manifest. It represents the doorway between the material and the immaterial. In the interpretation of temperament for example, Saturn represents coldness, hardness, heaviness and all things gloomy and depressed. It’s more positive associations include responsibility, duty, and authority. For those beginning the study of astrology it is most helpful to first understand the meaning of the classical planets, before studying the astrological significance of the ‘modern’ planets. Astrologers categorise planets other than the visible ‘classical planets’ described above as the ‘modern planets’. These include Uranus, Neptune and Pluto. Some also include Ceres and Chiron in this category. The more recently discovered cosmic bodies in the Kuiper and Oort belts, whose definition as planets or dwarf planets has been the subject of debate within the IAU (International Astronomical Union), may also be included within the list of ‘modern planets’. The astrological meaning of the modern planets (most of which are now categorised as ‘dwarf planets’ by the IAU) beyond the orbit of Saturn has to do with the unconscious realm of the human psyche. This is also reflected by the names assigned to them by astronomers. The further from Earth they are placed, the more their meaning is associated with deeper levels of the unconscious psyche. Because the classical planets rule everything on this Earth, the modern planets are secondary in importance. However their importance in astrological interpretation is elevated if they are placed on an angle or in close proximity to an important significators. Modern astrologers describe the modern outer planets as ‘transcendental’ which suggests that they cannot rule the signs or mundane houses. Only the classical planets can rule signs and houses. The modern planets DO NOT rule any signs and they have no association with any of the signs. In any astrological analysis the first and most important layer of study is the luminaries and planets. They are like the actors on a stage and contain the essential energies that reveal the make-up of whatever subject is the focus of study. Together they constitute ‘the engine’ of the horoscope. Without them astrology is nothing. Next in order of importance are the zodiacal signs in which the cosmic bodies are placed, and thirdly, the houses in which they are placed. The zodiacal signs describe how the luminaries and planets function, and the houses pinpoint the area of life in which their energy manifests. Any basic appraisal of the luminaries and planets is incomplete without an assessment of their condition in the horoscope being studied. Their condition, which describes their ability to express their nature, includes the aspects between them, plus their essential and accidental dignities. The planets have natural rulerships and ‘accidental’ rulerships.